Avenue for the Arts has written dozens of stories for The Rapidian since 2009. Coordinator Jenn Schaub said the platform opens up a dialogue. This civic investor profile is a part of a series of stories introducing civic investors to the community. Each story features someone whose contributions have helped The Rapidian. Donate to the Spring Fund Drive, April 10-17, here. Since The Rapidian was founded on September 15, 2009, dozens of nonprofit organizations throughout the community have published articles and stories. Avenue for the Arts is an organization that has truly seized on the opportunity to share its stories on the community platform. In fact, since 2009, Avenue for the Arts has contributed more than 100 stories by different writers. Avenue for the Arts is a neighborhood title for the South Division commercial corridor. The organization is made up of residential, commercial and nonprofit groups working together in a creative community. Supported by Dwelling Place, the Avenue for the Arts program builds community while connecting the creative culture of Heartside. 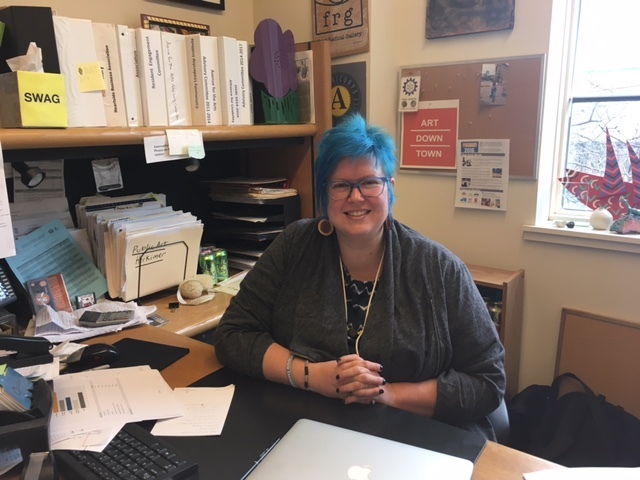 Jenn Schaub is coordinator for the Avenue and coordinator of the Neighborhood Revitalization Department at Dwelling Place. Born and raised in West Michigan, Schaub is a member of Downtown Grand Rapids Inc.’s Alliance for Livability and a member of the Grand Rapids Art Museum commission. She’s also a board member of the Heartside Business Alliance. "The Rapidian provides a window of voices that might not get heard otherwise," Schaub said. "Published stories open up a dialogue on many issues." At the Avenue, Schaub works with a team of interns to brainstorm topics for Rapidian articles.